After Tajikistan, I planned to travel overland from Urumqi, Xinjiang to Yinchuan, Ningxia. First, I would travel with seven friends from Dunhuang to Zhangye and then with Bing from Zhangye to Ningxia. While flying from Dushanbe to Urumqi, I came up with the idea of travelling overland from Urumqi all the way to Hong Kong. Eventually, I made an overland trip by high-speed train and by road for the entire journey except the sector between Yinchuan, Ningxia to Beijing. It’s time to leave Tajikistan after having spent 12 days roaming in this less-travelled landlocked country! Our plane took off before 11 am and we arrived at the Urumqi airport around 4 pm local time. As the airport bus would not take us to the Grand Mecure Hotel, Kylie and I had to take a taxi (about ¥50). To our horror, we queued for an hour though the queue was not long at all. The problem was a result of inefficiency, tight security at the airport and poor traffic management. We had a long day and were tired. After having a light dinner, we were ready for bed. 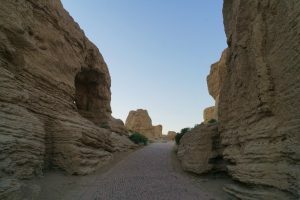 As I had to arrive in Dunhuang to meet my travel buddies on or before October 12, I had five days to spend on my own. 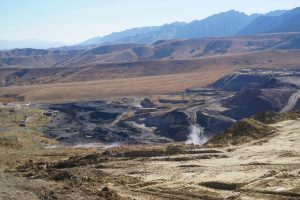 I stopped at the travel agent in the hotel and decided to join a day trip to the Tianshan Grand Canyon (¥290) and a 2-day trip to Tulufan (¥1400). 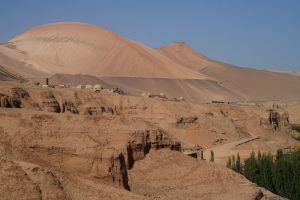 From Tulufan, I could make my way to Dunhuang by train. It’s my third visit to Urumqi 烏魯木齊, the capital of Xinjiang 新疆 Autonomous Region with a population of over 3.5 million. I find the sprawling city messy with poor town planning. Kylie departed for the airport at 7 am to catch her homeward flight. I was advised to take a taxi to the meeting point at a shopping mall which is not far away. Unfortunately, it was early and there were few taxis on the road. I ended up taking an unlicensed hire car (known as ‘black car’) whose driver asked for ¥15. The meeting time was 8:30am. My driver from Chongqing could not find the place and called the tour guide for direction. Apparently, the guide lost her patience and refused to talk with him. We circled around while the coach departed on time. For the next twenty minutes, my driver and the tour guide were in heated arguments over the phone. My driver was upset while the local guide was furious. At one time, I told the driver to take me back to the hotel. He did not give up. We finally caught up and found the coach by the highway. He apologised for his mistake and did not want to take my money. As he had driven me around for some 40 minutes, I paid him ¥25. I was embarrassed by the stares of some 50 angry Mainland passengers on the coach. They thought I was stupid and should not have taken a ‘black car’. They kept asking me how much I had paid and told me I should not have paid him. A bad start of the day! 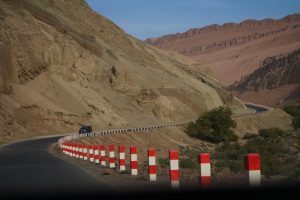 The canyon is only some 30 km from Urumqi. We arrived before 10 am. Despite the beautiful description from the brochure, the canyon is neither grand or special. We first took a shuttle bus to the Swan Lake where the group could spend two hours in the grassland taking a walk or riding a horse. The grassland and the lake are tiny by Chinese standards. 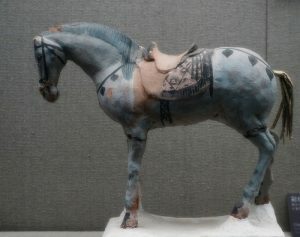 Horse riding is meaningless: the poor animal which is led by a man, treads slowly. No fun at all! I saw a ridge at the end of the grassland and decided to find out what lies on the other side. It is an easy walk. I then discovered a coal and natural gas mine below the ridge. I realise that this scenic spot has been created as there is already a well-paved a road to the mine in the canyon which is also a water-catchment area. At 12:30pm, I took the shuttle bus to a resting area for lunch. The tour guide handed out coupons for a dull plate of fried rice (plov). We had free time till 3pm to walk around the area to see a few artificial lakes and waterfalls. I have seen too many beautiful natural lakes and waterfalls including the Niagara, Victoria and Igaucu Falls. After walking for an hour, I felt so bored that I slept for 15 minutes in the rest room outside the toilet. This is the first time I have taken a nap out of boredom on a tour! The bus departed the canyon before 3:30 pm. Then we were taken to a dried fruits wholesale market which consists of several gigantic storehouses. We entered one of them to find only a dozen stores out of a hundred open. I was bored and found nothing worth buying. The coach dropped all passengers off before 5pm near a shopping mall. It is the worst tour I have ever joined. But it’s my own fault as I had made a bad choice. When I was back in the hotel, I detailed my disappointing day to the manager of the travel agent. I asked him not to recommend this trip in future. Today’s trip began with a ride on the high-speed train from Urumqi to Tulufan (also known as Turpan) at 8:35am. I was told to arrive at the station at least an hour before departure. So, I had to take a taxi at 7am at a cost of ¥40. The manager of the travel agent told me I could retrieve my ticket from the machine. He is wrong: holders of a Home Visit Permit can only get tickets from the ticket office after the staff have checked relevant documents. Anyway, I met my guide Fei at the gate before boarding the train. The one-hour train ride is excellent. Xinjiang Autonomous Region, the largest province in China has an area of 1.6 million km2 and a population of about 22 million. 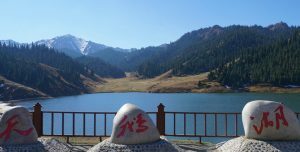 It is divided into 13 prefecture-level divisions including four prefecture-level cities namely Urumqi, Tulufan, Hami and Karamay City. 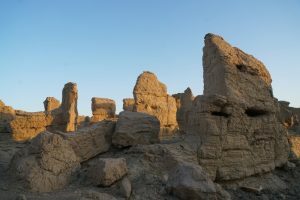 Tulufan 吐魯番, the second city in Xinjiang with an area of 70,049km2 and a population of 632,000, has been the centre of a fertile oasis and an important trade centre of the ancient Silk Road. 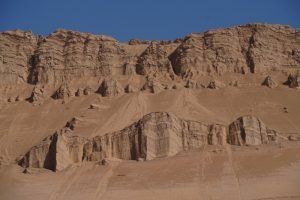 The area around the city, the Turpan Depression is the lowest point in China and second lowest on Earth (after the Dead Sea) at 154m below sea level. Uyghurs are the biggest ethnic group in the area (70%) followed by Han Chinese. 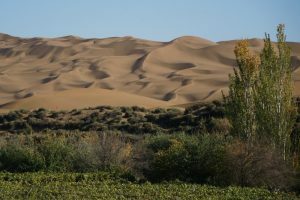 Tulufan has a harsh drastic cold desert climate with very hot and long summer and very cold and long winters with temperature ranging from -29°C to 48°C. 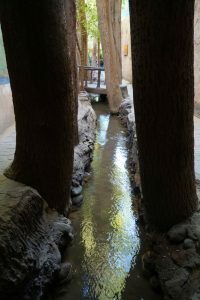 The local people have developed karez, an ancient irrigation system composed of wells connected by underground channels to counter the heat and drought. 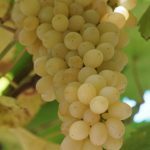 The high heat and dryness of the summer combined with the area’s irrigation system enables the countryside to produce high quantities of high-quality fruit. Its economy is based on agriculture growing vegetables, cotton and fruits especially grapes. I got off the train before 10 am and met 20 Mainland tourists outside the train station. We visited two attractions before lunch. The mountains are 98 km long and 9 km wide with its highest peak at 851m above the sea level. These red, barren sandstone hills are the hottest place in China where temperatures can reach over 50° in the summer. It is a major tourist attraction based on the Chinese epic, Journey to the West. Tulufan using the karez underground irrigation system has grown the best grapes in China for over 1000 years. Most grape and raisin are produced in this valley measuring 8 km long and 600-2,000m wide, accounting for over 80% of China’s total making the world’s third largest producer of raisins and the world’s largest producer of green raisins. Though I had paid ¥1400 for the 2-day trip, I was asked to pay another ¥140 for lunch with cultural performance. Both the food and performance were not particularly good. I should have skipped it. In the afternoon, we visited three more attractions. 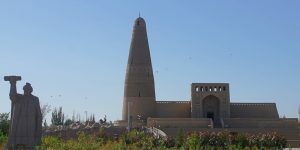 Built in 1777 in honour of the heroic Turpan general, Emin Khoja, it is the tallest minaret in China and an icon of Tulufan. But it is forbidden to climb the minaret. 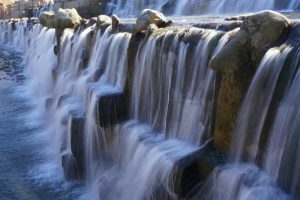 This irrigation system developed over 2,000 years ago, is composed of vertical wells, underground canal and open canal and small ponds or reservoirs. The underground canals are at a height of 1.5 – 1.7m and a width of 0.6 – 0.7m, with total length of 5 – 20 km. It is considered one of the three great ancient projects in China (the others are the Great Wall and the Grand Canal). The number of karez in Xinjiang once reached 1,784 with 172,367 vertical wells, 5,272 km long underground canals and 858 million cubic meter of annual water output. Today 404 karez (out of the 614 remaining ones) are in Tulufan with yearly output of 230 cubic meter of water. Located in Yarnaz Valley, the city of Jiaohe built on a large islet measuring 1650m long and 300m wide at its largest point, was established during the Western Han Dynasty. From 108 BC to 450 AD, it was the capital of the Anterior Jushi Kingdom, concurrent with the Han Dynasty, Jin Dynasty and the Northern and Southern Dynasty according to Tang dynasty records. Among the earliest settlers of this area are Indo-European speaking Tocharian who inhabited here no later than 1800 BC. 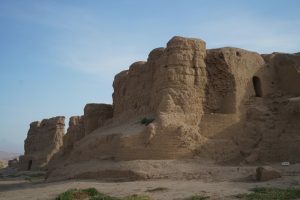 The city perching on a 30m-high plateau which from natural defence, was an important site along the Silk Road. It became Jiao prefecture in the Tang Dynasty from 450 AD to 640 AD with a population of about 7,000. Owing to its strategic importance, it became the seat of the Protector General of the Western Regions, the military post of the highest level in west from 640 AD to 658 AD. 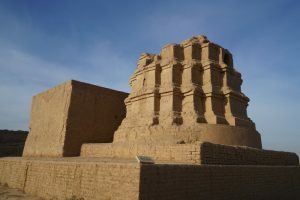 It continued to prosper but was finally abandoned after its destruction during an invasion by the Mongols led by Genghis Khan in the 13th century. 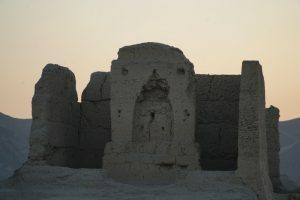 The ruins were visited by Aurel Stein, an archaeologist and explorer who made four major expeditions to Central Asia in 1900-1901, 1906-1908, 1913-1916 and 1930. He described it as “a maze of ruined dwellings and shrines carved out for the most part from the loess soil”. The site was partially excavated in the 1950s and has been put under government protection since 1961. 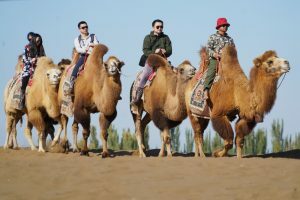 On June 22, 2014, UNESCO designated a 5,000 km stretch of the Silk Road network from Central China to the Zhetsyu Region of Central Asia as a World Heritage Site known as the “Silk Roads: The Routes Network of Chang’an (present day Xian) – Tianshan Corridor” which spans China, Kazakhstan and Kyrgyzstan and includes a total of 33 properties including the Jiaohe ruins. 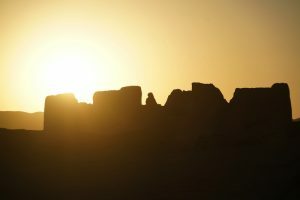 The best time to visit the ruins is at sunset when golden sun rays lit up the ruins. We entered through the entrance in the south, walked along the main street and saw the ruins of large government offices. All visitors are required to follow the boardwalk in order to protect the ruins. Fei gave a brief introduction on the ruins at the viewing platform which affords a panoramic view of the ruins at sunset. He pointed out a large grave yard where skeletons of over 50 children had been discovered about ten years ago. We were given 30 minutes free time. I joined a few members of the group and headed north to visit the imposing temples and stupas. It’s most atmospheric to watch the sun sinking below the horizon. On the way, we passed through the eastern and western residential districts. We left Jiaohe after 7:30pm. Around 8 pm, the coach dropped the group at the train station. All except a young man from Dalian and I returned to Urumqi that evening. Fei arranged us to stay in a hotel next to the station. As there were only two persons joining the two-day tour, the travel agent provided us with a private car with a lady driver. She picked up us at 9:30 am and took us to the Turpan Museum which houses more than 5,000 artefacts. There are three exhibitions on the ground floor. 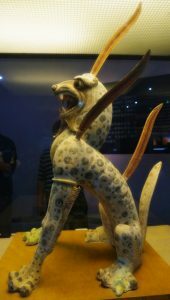 The exhibition on the general history of the Turpan area in the main hall is informative with many remarkable cultural relics. I enjoyed the Giant Rhinoceros Fossil Exhibition most. I have seen many rhinos in my life. 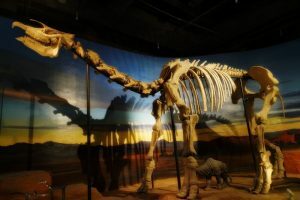 But I did not know the giant rhinoceros, the largest land mammal ever known, lived in the area about 20 million years ago. The fossils here are most impressive in both scale and presentation. The third exhibition in a small hall is on excavated documents and silver and golden coins. Scripts and documents covered from the Sixteen Kingdoms Period (304 – 439 AD) during the Jim Dynasty (265 – 420 AD) to Yuan, Ming and Qing dynasties. I saw many old documents written in different languages which were discovered at Astana and Gaochang graveyards. The main hall on the upper floor houses the Ancient Mummy Exhibition which is the star attraction of the museum. There are nine well-preserved mummies and one skeleton from the Astana Cemetery. The earliest one is the 3200-year-old body. Burial objects, mural paintings, relics of graves and silk paintings are also on display. After spending two hours in the museum, our driver took us to a local eatery nearby for lunch. She ordered a bowl of noodle for me which might cost about ¥10. She also bought naan (bread) for us to try and fill our stomach. 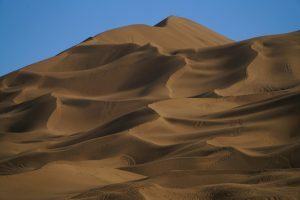 The second attraction today was the Kumtagh Desert which is not part of the larger Taklamakan Desert. We spent about two hours on the road. 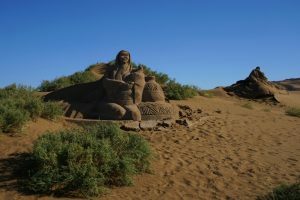 The sand dune park is close to Shanshan. We arrived at the park after 2 pm. We could either hike to the top of a sand dune or take a ride in a 4WD jeep. While my young friend paid ¥150 for a ride, I preferred a leisure hike as I had 4WD rides many times in the desert. It’s steep and it was not an easy hike. But I managed to reach the top without problem and had fantastic panoramic views of the oasis and the desert. The place was not crowded. Unfortunately, senseless yelling by a group of Mainland retirees and poor singing of a couple of ladies at the top of the dunes ruined my mood. Where can I find peace and tranquillity in China? I did not stay long as I had been told to be at the entrance by 3:30 pm. I was punctual. But the driver and the young man were late by 20 minutes. I could have spent another 20 minutes walking along the ridge of the sand dune. On the way out, the shuttle bus took us on a short tour of the desert to see a few more spectacular dunes. I began to appreciate the natural beauty of this small corner of the desert. Around 4 pm, we finished our tour and the driver dropped the young man off at a high-speed train station nearby. In this way, he could take the 5:30 pm train and back in Urumqi by 7 pm. I was back at the Tulufan train station around 6 pm. I bought a ticket to Liuyuan South (¥195.5) on October 11 and to Hong Kong from Beijing on November 2 (¥1,050). At my request, Fei arranged a hired car for ¥350 to take me to see two more attractions. We set off at 8:45 am and arrived at the Gaochang Ancient City 高昌故城 (30km southeast of the city) at 9:15 am. The walk along a path around the entire site is about 6km. As I had to leave around 11 am the latest, I had to take a 40-minute tour on a mini-bus for ¥30 in addition to paying a reduced entrance fee of ¥70. 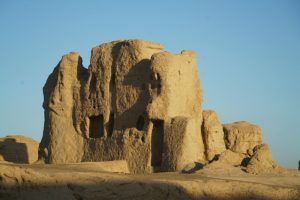 Gaochang was an ancient oasis city first on the northern rim of the Taklamakan Desert. 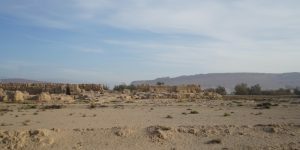 The city-state covering an area of 2 million m2 and a busy trading centre on the ancient Silk Road, is the largest remain site in the ancient western regions. It was destroyed in wars during the 14th century. Today, not much of the ruins are left. 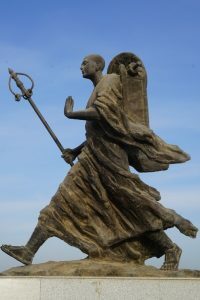 Xuanzang玄奘 (c.602-644 AD), a monk left China in 629 AD to travel to India and returned in 645 AD with “over 600 Mahayana and Hinayana texts, seven statutes of the Buddha and more than a hundred sarira relics”. 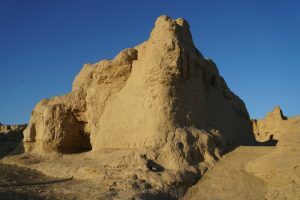 On his way to India, he arrived in Turpan in 630 AD and was highly regarded by the King of Turpan, a devout Buddhist who equipped him further for his travels with letters of introduction and valuables to serve as funds. It is impossible to visit the expansive site in an hour. Hence, I set a realistic goal and planned to take a cursory look to gain an impression. There were only half a dozen visitors arriving before me. 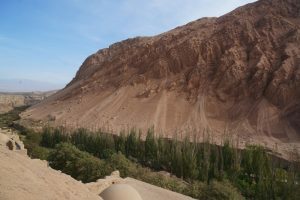 We stopped first at a large stupa and then expansive ruins including several-storeyed high ruins and grave yards with the Flaming Mountain in the background. After the second stop, other passengers decided to walk on their own. If I had time, I would have done the same. As a result, I had the bus and the driver who became my guide. 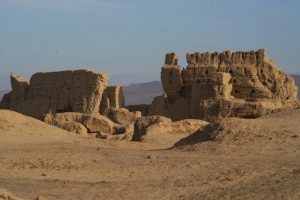 He was very good and gave me time to explore the ruins of the palace and the temple where Xangzang had preached for a few months while staying in the kingdom in 630 AD. I also stopped at a few major spots including a stupa, a large merchant quarter, a graveyard, the ruins of the palace and the inner as well as outer walls. 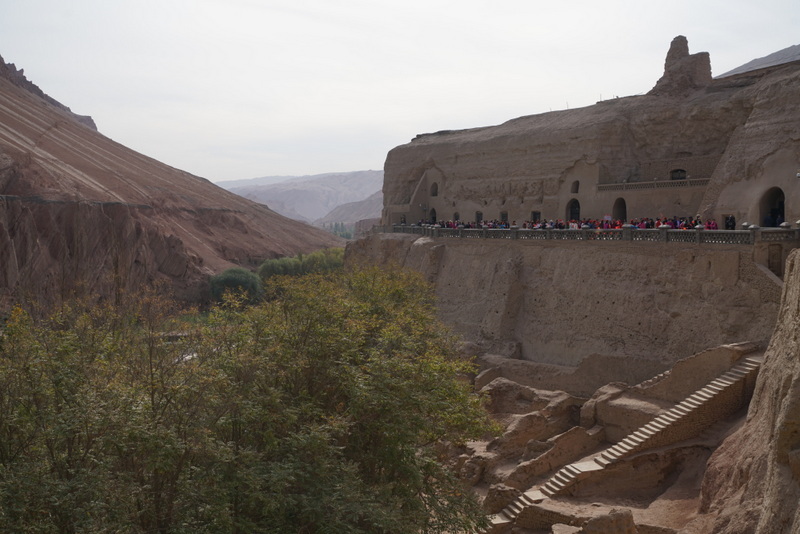 My second and final stop was the Bezeklik Thousand Buddha Caves柏孜克里千佛洞 (45km east of the city) standing high on the cliffs of west Mutou Valley under the Flaming Mountain. Construction began in the Southern and Northern Dynasties and the caves had been the Buddhist centre of Gaochang. Buddhism in the area began to decline in popularity following the introduction of Islam. Near the end of the 13th century, the royal family of Gaochang moved to Yongchang, Gansu. 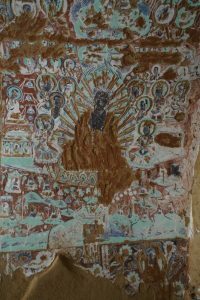 As a result, the religious importance of the caves became less apparent. Many were destroyed during the ensuing religious clashes. Vandals and foreign explorers in the 19th and 20th centuries also robbed the caves of much of the treasures. Today, 57 out of the 83 original caves remain. 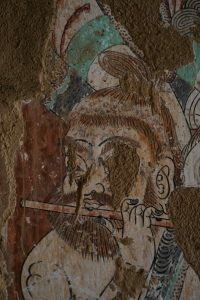 The murals cover an area over 1,200 m2 in more than 40 caves. I paid a reduced entrance fee of ¥40 but visited the four caves that were open. The caves are small and almost empty. The murals are barely invisible. I could hardly get in the caves as six coaches with some 300 local tourists arrived at the same time. I departed around 12 noon and was dropped off at the station 30 minutes later. Though the high-speed train station is new, there is no lift or escalator to the platform. I must have looked stressful: a man came up and offered to carry my 23-kg suitcase to the platform. I fully appreciate his help. The train departed at 1:12 pm and I arrived at Liuyuan before 5 pm. Minibuses were waiting outside the station. Dunhuang is 150 km away and I paid ¥30 for a ride. About a third of the road is still under construction and bumpy. I watched sunset over the eerie landscape with blackened hills in a distance. I took a taxi after getting off the minibus and finally arrive at Dunhuang Hexi Hotel just after 7:30pm. Bian, our Dunhuang guide, was already waiting me at the lobby. We had lamb and fresh vegetables for dinner. I enjoy my spacious and comfortable room and balcony with views of the Mingsha Mountain.